The Monet paintings seemed sketchy and unfinished to many critics of the time. (Today's audiences appreciate this technique for the sense of light, movement and atmosphere that it gives, but the Salon standard was to "finish" paintings by giving them a smooth, overall surface, rather than a "broken" surface.) 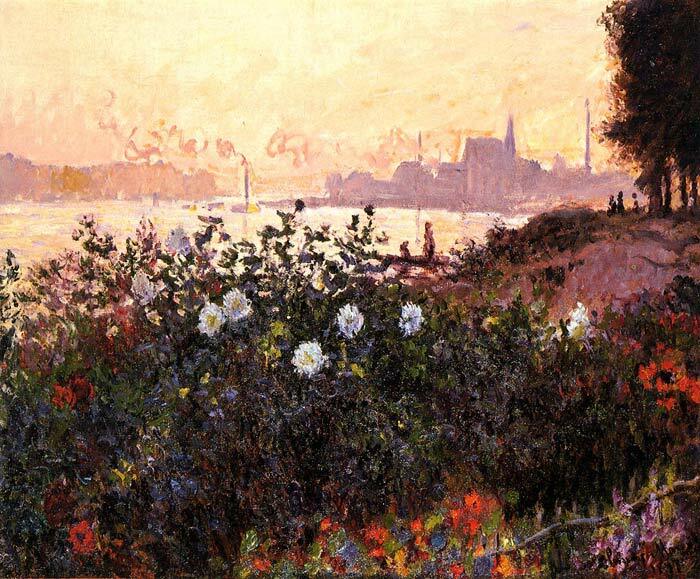 The sketchy nature of the paintings of Monet, their apparent lack of structure, and the lack of "important" subject matter caused critics to scorn these independents in the press, calling them "Impressionists" - coining the term in mockery of Monet's "Impressionism: Sunrise," which was displayed at the first Impressionist show in 1874. SPECIAL NOTE : The painter will make the reproduction as close to the original oil painting as possible. If you want your painting to alter from this likeness, please email us and " Argenteuil, Flowers by the Riverbank, 1877	" will be reproduced according to your special requirements.